This exhibit available for purchase or rental. Drawing from its remarkable archive and additional sources, Syracuse Cultural Workers curated this inspirational and educational exhibit on African American women from the 1800’s to present. While by no means exhaustive, “Sisters of Freedom” provides a dramatic glimpse of the power and passion of women who have transformed their lives, their culture and their country. The exhibit profiles 41 African American women, and includes a poster featuring 33 Women Freedom Riders (1961). The exhibit is appropriate for ages 12+ and its accessibility makes it usable by a broad range of organizations and institutions including schools, community centers, museums, faith groups, universities and unions. 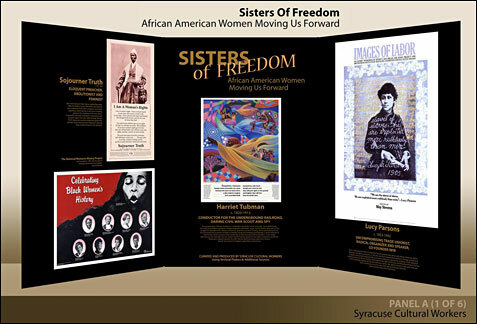 “Sisters of Freedom” consists of six 4’x8’ panels that accordion fold so they free stand. Lightweight and portable, it displays on six 6’ tables and can be set up in 30 minutes. A smaller version features six panels which are each 33" wide by 16.5" high. 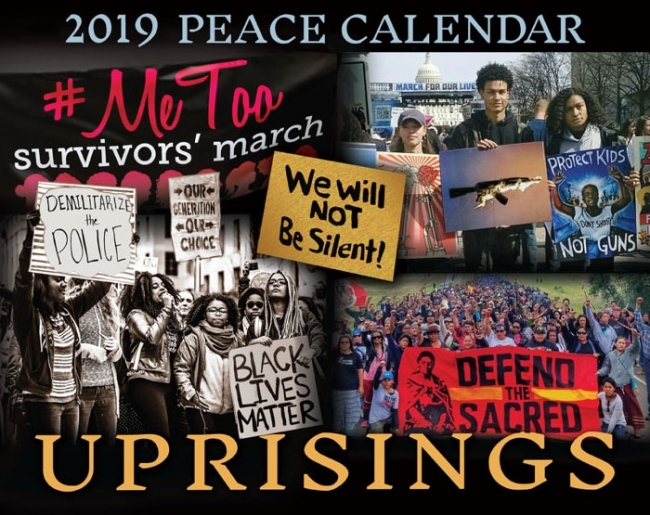 Maya Angelou, Ella J. Baker, Daisy Bates, Mary McLeod Bethune, Unita Blackwell, Ellen Blalock, Kimberly Freeman Brown, Majora Carter Shirley Chisholm, Septima P. Clark, Claudette Colvin, Cheryl Contee, Dorothy Cotton, Angela Davis, Marian Wright Edelman, Sarah Loguen Fraser, Fannie Lou Hamer, Dorothy Height, Anita Hill, Zora Neale Hurston, Coretta Scott King, Barbara Lee, Audre Lorde, Cynthia McKinney, Pauli Murray, Diane Nash, Eleanor Holmes Norton, Odetta, Rosa Parks, Lucy Parsons, Imani Perry, Bernice Johnson Reagon, Gloria St. Clair Hayes Richardson, 1961 Freedom Riders, Lateefah Simon, Nina Simone, Barbara Smith, Sojourner Truth, Harriet Tubman, Alice Walker, Ida B. Wells-Barnett. Download the Sisters of Freedom Guidebook here [pdf]. 30 dynamic, green-themed posters mounted on six cardboard panels. most of Milton's series, with introductory remarks by Studs Terkel. resistance to and commentary on US government policy.